DIY, Functional Art, Upcycled Crafts, Organization. 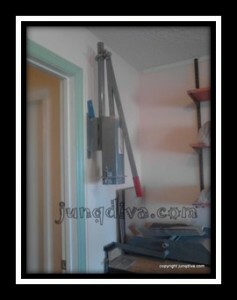 Junqdiva? What the heck is a Junqdiva? IS YOUR CREATIVE INSPIRATION HIDING? Is your Creative Muse hiding under a basket…or a box…or a tub? 1: What is your Creative space like? Is it the perfect set-up? Everything in it’s place, well organized and labeled. 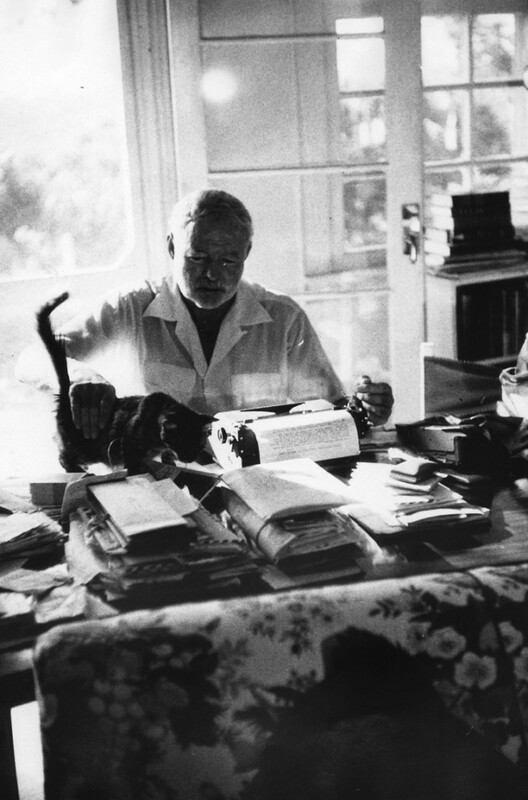 If you’re anything like me then you’ve got stuff all over the place. And it’s not from lack of trying to create the perfect studio space. There are lot’s of things that can get in the way that end up derailing the best laid plans and intentions. I had recently moved and was in the process of setting up the perfect studio. We’d gotten a house with two more rooms than we needed so we could each have our own creative space. But the recession hit and suddenly families were faced with getting creative in their living arrangements as households merged. Such was our case. Lot’s of my stuff got boxed up and consolidated. As well as periodically moved from location to location in the house as we experimented with various solutions to accommodate everyone now living in our home. 2: Do a lot of your supplies live in assorted boxes and Rubbermaid tubs? Maybe they’re organized beautifully or lost somewhere in the stacks of stuff in the garage and attic. Tucked away under beds or high up on closet shelves? Organized or not, the fact remains, they are shut up…in darkness or in the hazy light that diffuses through the frosted plastic of a tub. Can you see them? Do they inspire you hidden from view as they are? 3: Are you waiting for conditions to be perfect before you start a project? In a perfect world such conditions might actually exist…but as we are all very well aware, conditions will never be perfect. There will never be enough time. 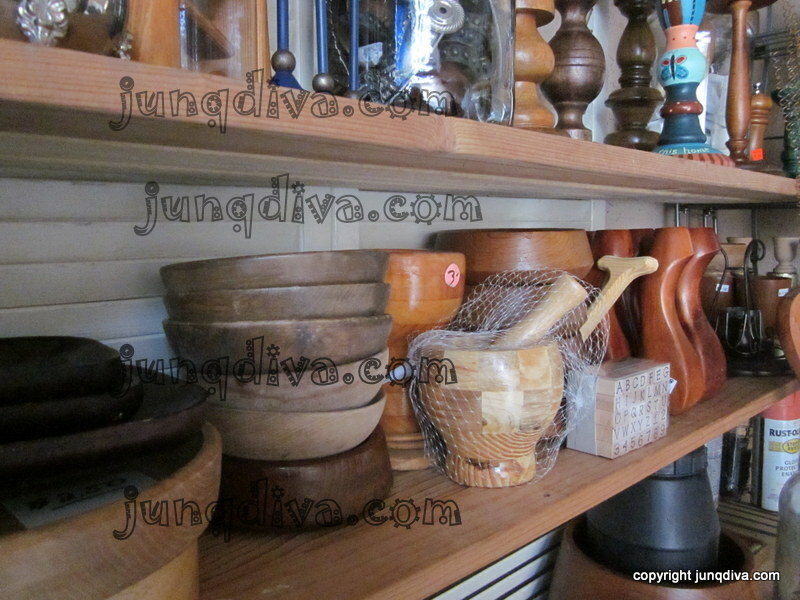 Your Creative space will never be finished–and isn’t that a wonderful thing?! It will always be a work in progress because that means it’s being utilized. 4: Is a lack of money for organizational supplies holding you back? Wouldn’t we all love to have the latest and greatest craft storage components. 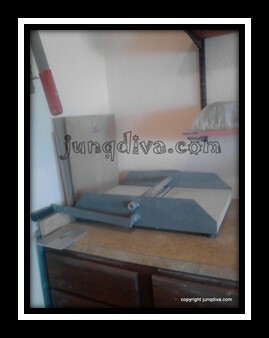 Personally, I get more satisfaction getting creative with found and re-purposed items to create craft supply display and storage units. For me, being able to see and touch all of the supplies and tools at my disposal are a big part of what fuels my creativity. I try to get them out into plain sight. That is where they do their best inspirational work. They aren’t much good if they are tucked away in a box or a tub. You’d be surprised how much building a pretty work environment can inspire the creative projects that comes out of it. For years I’ve been accumulating items for a specific type of project. The problem was I never got around to actually making even one of the fabulous designs fighting for space in the creative attic of my brain. Why…? I had most of the components, granted they were as scattered throughout the house as my wits. I knew they were there…somewhere, but as the saying goes ‘Out of Sight Out of Mind’. The time had come to put an end to my excuses and procrastinating. I sought out and collected most of the items (I’m sure there are several still lurking about) And then I set about making a creative space just for them. The only things I bought specifically for the project were eight cinder blocks at $1.60 a piece. The rest of the items were things I already had; from curb and thrift shopping, re-cycling and yard sales (I’m not called the Junqdiva for nothing). I’ll post an itemized list at the end of the pictures. 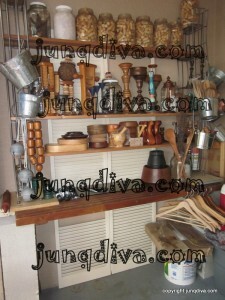 This is my work space/storage area for all of the wood components I use in my Creations. I used eight cinder blocks/four on each side stacked to create the table surface supports. 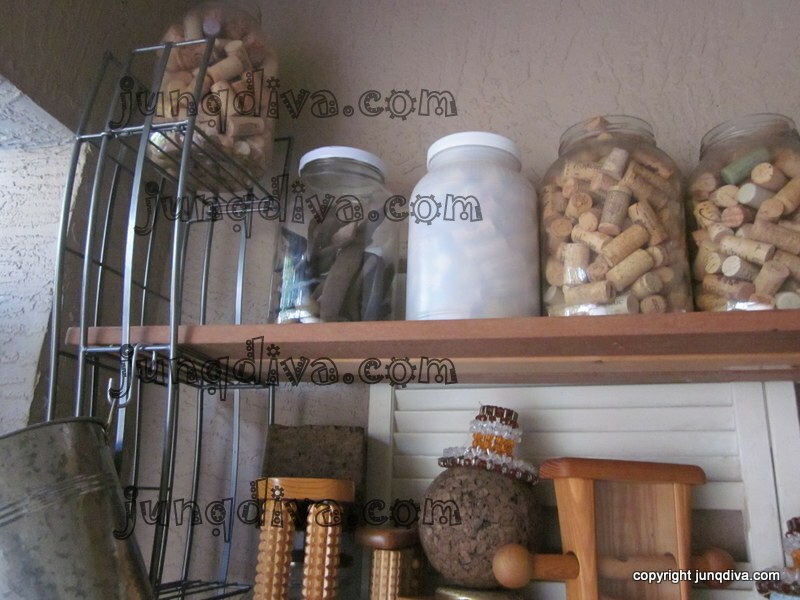 I left the center holes exposed for bonus storage space that I keep jars of supplies in. The background is a set of shutters I curb-shopped. I actually love the missing slats for the visual texture and detail it adds. It’s not just for eye candy, lightweight items can be hung off the slats for additional storage. The table surface is one of my favorite features of the unit. 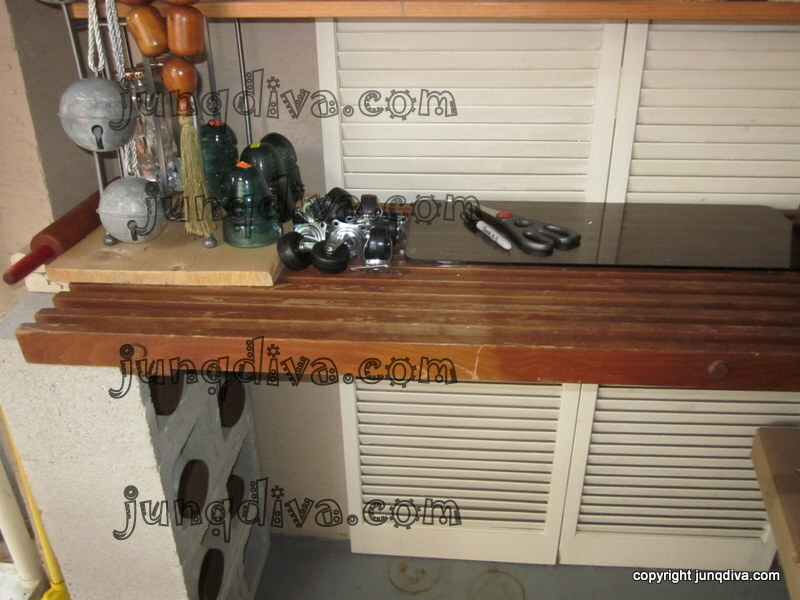 A mahogany diving deck salvaged from an old yacht is unique and pleasing to the eye. I keep an old glass insert from a discarded table on it when I need a smooth surface to work on. Four cinder blocks on each side, a curb shopped bi-fold shutter door and a re-purposed diving deck from an old yacht make up the base of the structure. For the side supports and shelves I used two steel folding CD racks and slats salvaged from on old futon frame. Because my table surface (the diving deck) is comprised of slats of mahogany, I placed a piece of scrap lumber under the legs of the CD racks so they wouldn’t fall through and unbalance. 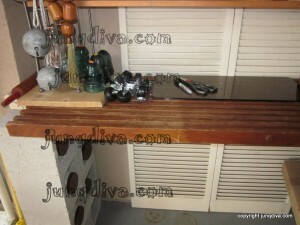 I used 3 slats each, laid side by side, to create the shelves. I ended up with three shelves total. I could have had more shelves but I chose to have larger gaps to accommodate my taller items. The sides of the unit are made from two matching steel folding CD racks and the shelves are made from the wood slats from an old futon couch. Galvanized buckets hang from ‘S’ hooks. They are ideal for storage of smaller parts and if you can’t see what’s in the bucket (especially if you are a shortie like me) then a simple label affixed with a magnet is a quick solution. Galvanized buckets for storage hang from ‘S’ hooks attached to the frame of the CD rack. 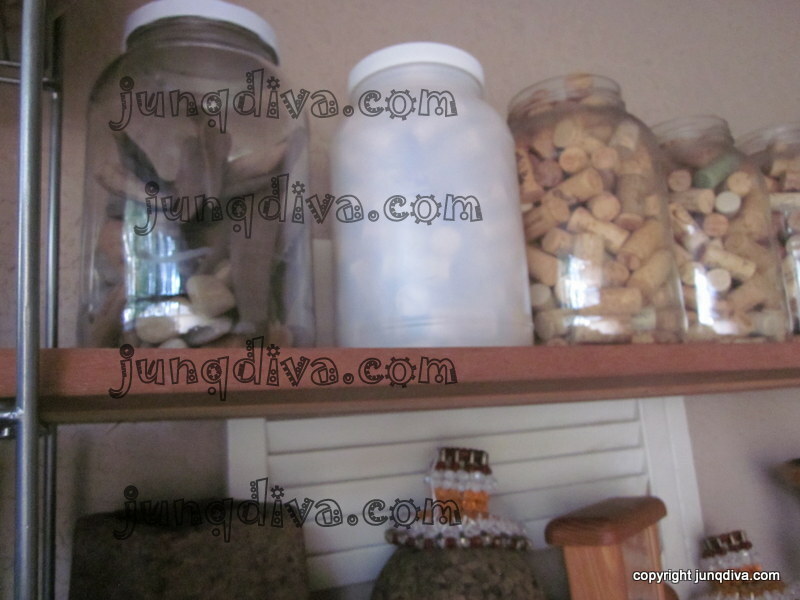 Gallon jars are ideal for the storage of small parts. 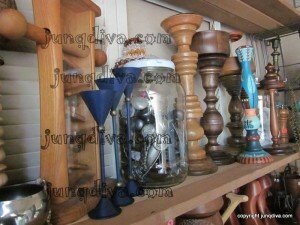 The glass ones are my favorite and I love the way the items are showcased through the glass. Who knew a bunch of old corks and pieces of driftwood could be so beautiful? Re-Cycled Gallon Jars from restaurants hold a wide variety of items. Another glass gallon jar holds a variety of vintage glass and steel knobs. There are a few brass fittings and handles thrown in too for good measure. Candlesticks and other odd bits of wood wait patiently to be re-created. I now visit them often and we play ‘What If’ quite a lot. Since I never know what may come my way in my ongoing search for wooden components, we mix and match until the right partners are found. Imagine if they were all still in a box somewhere…lonely and with little hope of Dancing with my Muse. A gallon jar of vintage knobs and handles along with a variety of wood items awaiting Re-Creation. 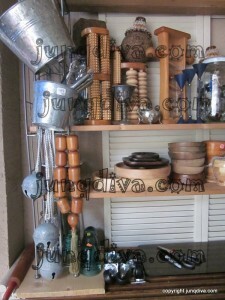 Wooden bowls, candlesticks and old wooden chair legs will find their way eventually into functional sculpture. The point is to get your supplies out where you can see and touch them. You use them to create beautiful things, which makes them beautiful in their own right. I promise… Your Creative Muse will be positively giddy with delight at your effort and it’s a safe bet She’ll come out of hiding and reward you handsomely with inspiration! Here’s a list of the items I used to build my work/display station. I stumbled over the Inns of Sanibel web site and was charmed by the photo gallery of the Seaside Inn. 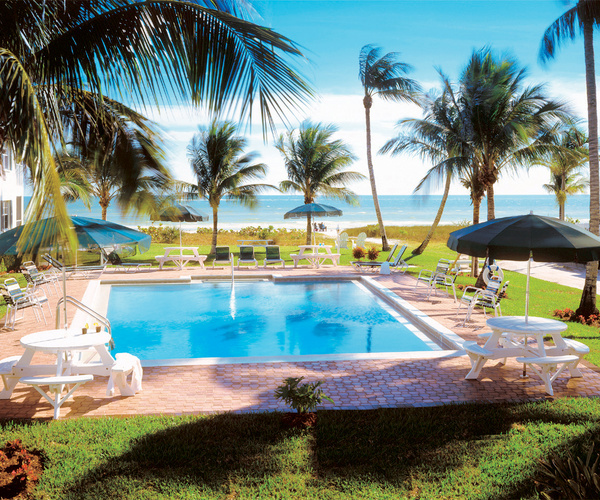 One of four properties that make up the Inns of Sanibel collection. It seemed just the thing, but I wanted to be sure. It was about 3am when I called the reservations number for the hotel and was routed to the night auditor who was on call for all of the properties. His name was Jack and he was wonderful with all of my many questions. Even the ones that weren’t necessarily specific to the hotel. Bless his heart! I hung up the phone with the certainty that this was where I wanted to stay. As soon as our shift ended, we rushed home to pack. We didn’t want to waste a moment. We had the most blissfully satisfying stay ever and we can’t wait to come back!!! A great new place in Flagler Beach for your consideration. I’m excited to talk about a new pottery shop in Flagler Beach, Down To Earth Pottery, which has a little bit of the everything you could wish for in a studio. For starters there is a sweetheart of an owner, Heather Wales. She’s following her dream of a little pottery studio by the sea and we are the lucky folks who get to benefit from her vision. I’m looking forward to spending some time there in the very near future. Head east to Flagler Beach on Rt. 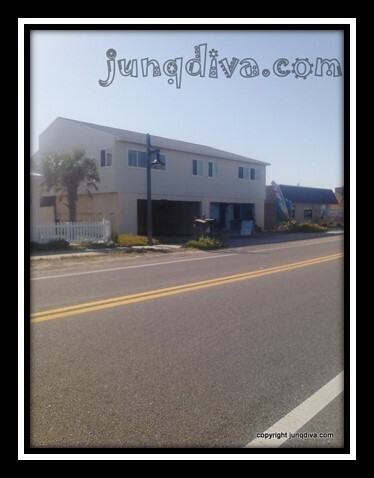 100 (Moody Blvd) take a left when you hit the ocean (A1A-Ocean Shore Blvd) you’ll go north eight blocks. The shop is on the left, ocean on the right. There is an abundance of street side parking. Inside you’ll find an intimate little studio chock full of all the things you’ll need to create your own works of whimsy in clay. 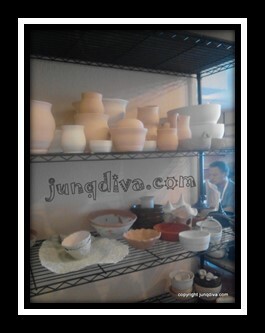 There are wheels for throwing, a slab roller, a wall mounted extruder, wedging table, work table, an in-house kiln, stacks of clay for sale, glazes to use, and lots of shelves to hold works in various stages of progress. I’m sure I’ve neglected to mention more than a few things but you get the picture. Speaking of pictures…the view from the window of the studio, looks right at the ocean. If the sounds of the waves, the sparkling glints shimmering off the water, the occasional glimpses of dolphins passing by and the call of seabirds in flight don’t inspire your creative soul…well I just don’t know what would. Never played with clay before? A little rusty on technique? Seasoned clay artist looking for a little social interaction with like-minded individuals? Heather can assist with all, rookie to expert. She has lessons available for all skill levels. Just want to make use of the studio space to do your own thing? The fee for studio time is very reasonable. Due to space restrictions, Studio time is based on availability, I recommend making a reservation. But don’t let that keep you from getting your creative game on; stop in, buy some clay and take it home to do a little hand building. Glaze, bisque and glaze firings are included with the purchase of your 25lb bag of clay. If you do pop in, please be aware that Heather teaches a lot of classes. If she does have a class in session when you arrive, please be considerate and keep your interaction to a minimum. I’m sure the students would be very appreciative. I was fortunate enough on this visit to meet and talk to a few of Heather’s students. All three were engaged in different activities. 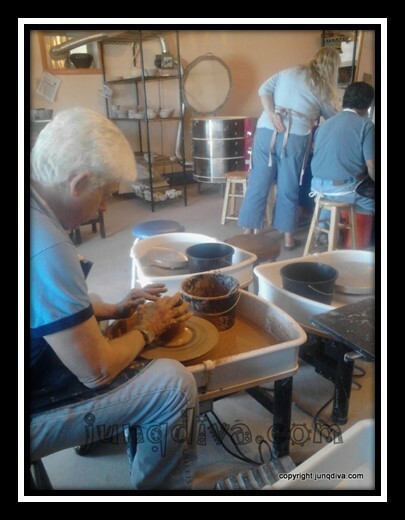 Don was throwing on the wheel, Eugenio was free-hand painting a sea turtle in underglaze on his bisque fired pot and Joy was doing a little creative hand building. I asked them how they came to discover Down to Earth Pottery and what made them decide to take a class. Don said that his friend Eugenio had told him about after taking his first few classes. Don told me the last time he’d worked with clay was back in 1969 while in high school and felt it would be nice to get back into it. On this particular day he had four new pieces to place on the ‘work in progress’ shelves. 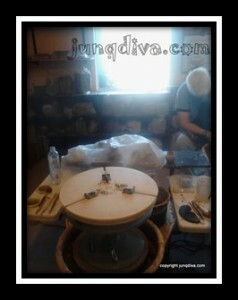 I asked Eugenio how he came to select a sea turtle to be the decorative element on his pot. He said he’s always been interested in the sea turtles that populate the area and supports the Flagler Beach Sea Turtle Patrol. 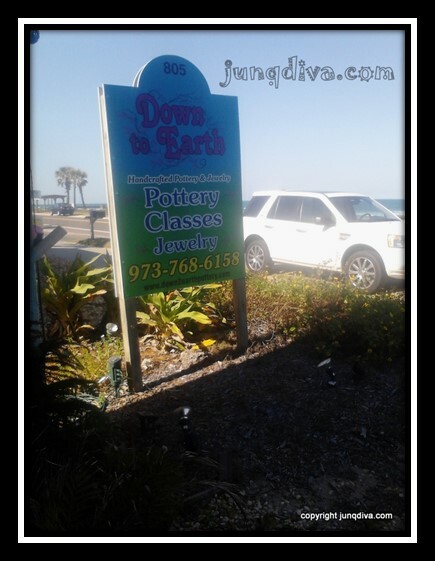 He discovered Down to Earth pottery when he saw her sign from A1A as he drove by. An interesting side note is that Eugenio graduated from the University of Maryland aka ‘The Terrapins’. Methinks his affection for this noble sea creature goes way back. Joy was busy working on hand building some jewelry pieces out of clay. She likes to create her art mostly for friends and family. 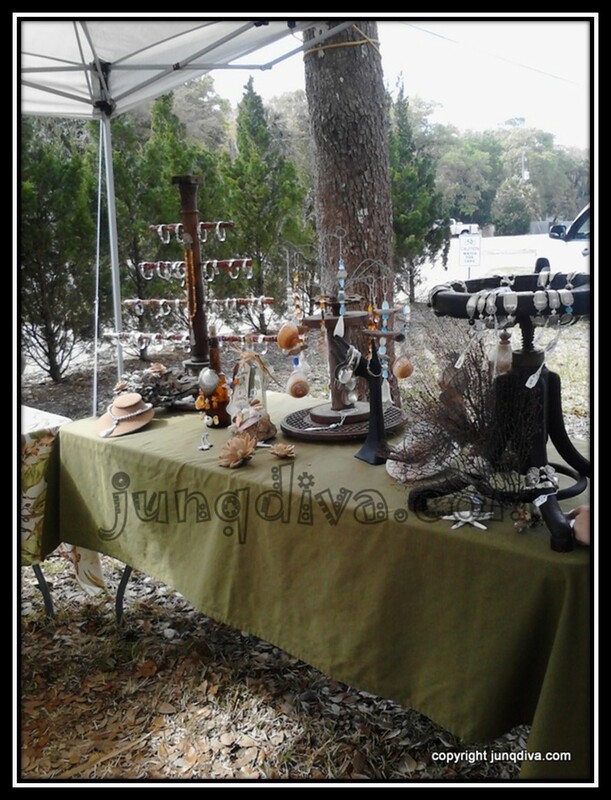 Joy found out about Down to Earth pottery when she spoke with a potter that sells their wares at the Flagler Beach Farmer’s Market, who told her she should come check out Heather’s shop. 11-Student Don throwing on the wheel. Down to Earth pottery. 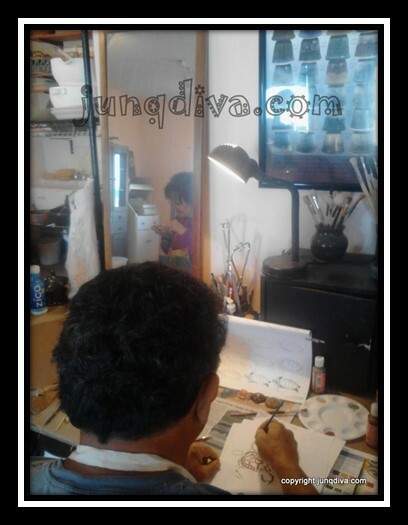 12-Student Joy creating hand-built jewelry (Eugenio in mirror’s reflection). Down to Earth Pottery. 13-Student Eugenio planning his design before painting it on his pot (Joy Reflected in the mirror). Down to Earth Pottery. Heather is originally from New Jersey, where she got her degree in Commercial Art. She spent twenty-five years in the corporate world working as a graphic designer for a printing company in New Jersey. 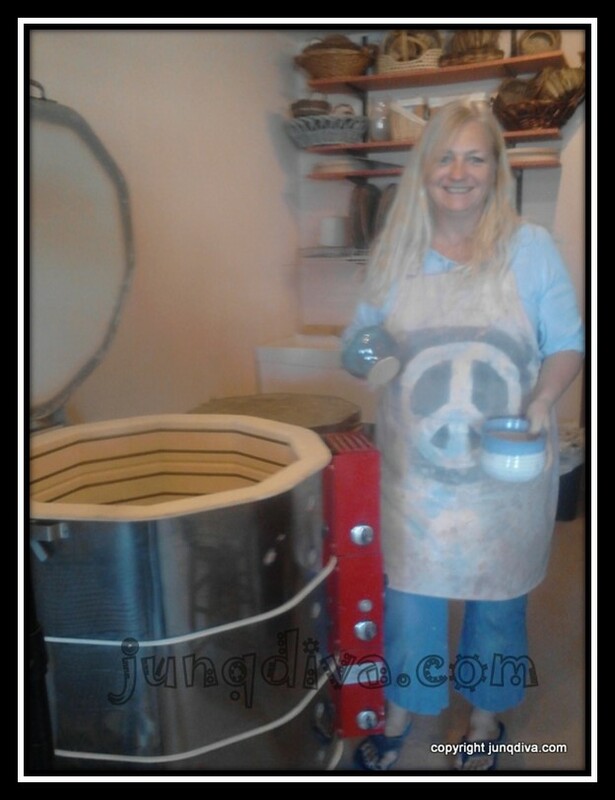 An opportunity arose that brought her to New Mexico to study pottery on an Indian Reservation. Now that’s what I call ‘Immersion Therapy!’ She spent a couple of years there honing her craft. 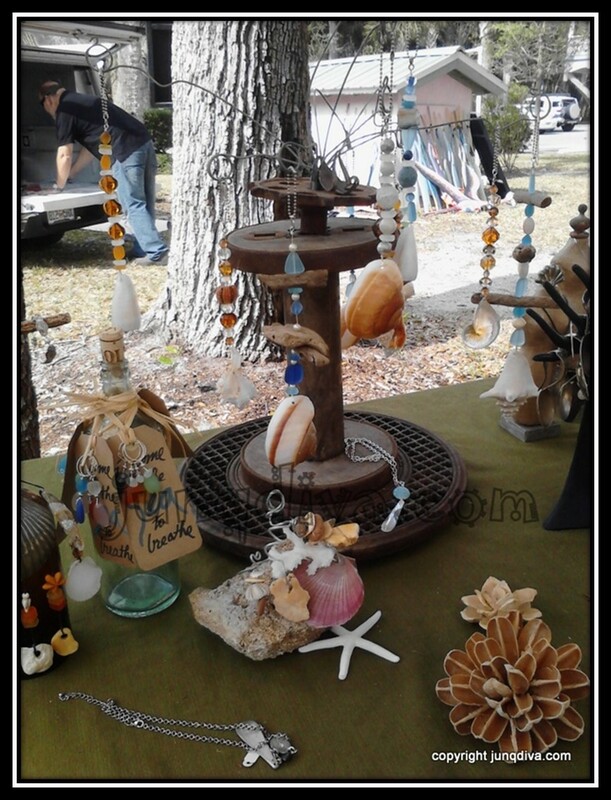 She worked out of a home studio and sold her creations at shows and on Etsy. 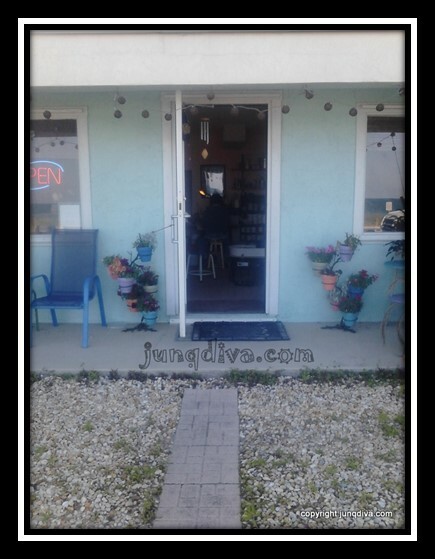 I asked Heather how she came to choose Flagler Beach for her shop. 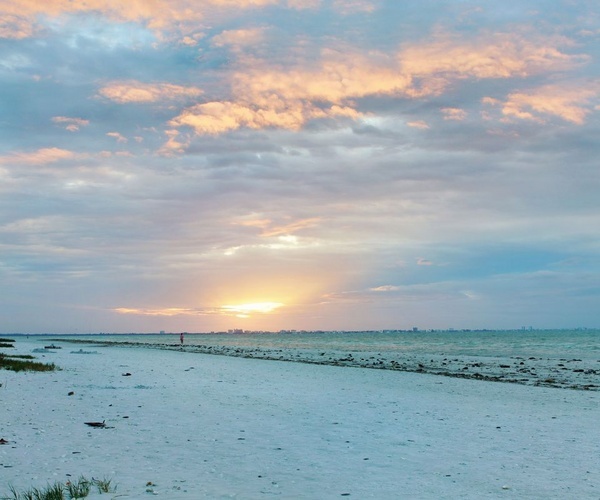 She said that her parents had moved here about five years ago and during the course of several visits she became a regular visitor to the beach. It was a long held dream to one day open a shop that overlooked the sea. I, for one, am so glad she has brought that dream to fruition! Flagler Beach is lucky to have her! 14-Heather Wales-owner of Down to Earth pottery-unloading the kiln! I really hope you will get a chance to visit Heather in her studio! If you’d like more information please visit Heather’s web site. Or you can email her. Well, I’m finally ready to enter my first official post. But maybe ready isn’t quite the word I’m looking for; it’s more like apprehensively optimistic. I’m still doing a lot of research on the best way to approach this whole endeavor, but I figured it was time to stick a toe in and test the water. Part of my problem is that I have so many thoughts and ideas on what I want to blog about that it’s been hard to decide. But a chance encounter, made possible by the beautiful goddess Serendipity, solved that dilemma. She’s always popping in when I least expect it and through the years she’s become one of my best friends. I’d had a rather turbulent week (perhaps more on the why’s of that later) and found myself in dire need of escaping the house for a while. I decided to check out a new pottery studio, Down to Earth Pottery, that had opened up in Flagler Beach. Working with clay is another one of my passions that has been put on the back burner for the past 7 years and I decided it was time to renew the love affair. There’s nothing like a little mud under the fingernails while you slam around a hunk of clay to set you right again. So I dug out my tool bucket, performed a cursory check for spiders and loaded it into the car. 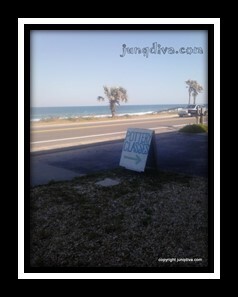 Happily I headed six miles east till I hit the beach and turned right onto A1A. 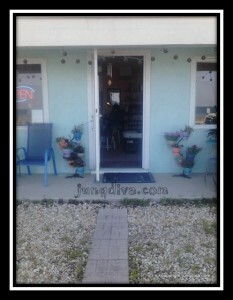 The shop was eight blocks up and I parked on the shoulder of a sand dune overlooking turquoise waves. Since I knew the shop was small and my tool bucket heavy (you wouldn’t believe the stuff I’ve got crammed in there) I thought it best to see if there was space for some studio time before I lugged it out of the car. That turned out to be a wise decision as she (Heather, shop owner) was expecting two classes and was booked solid. But all was not lost; I bought a 25lb bag of clay to bring home and play with. We discussed the next possible time I might be able to return, complicated due to my work schedule and family obligations, and bid each other a good day. Hugging that wonderful new bag of clay tightly to my chest I couldn’t resist giving it a little love pinch…oh the joy…almost indescribable! After loading it into the car and getting myself settled, I realized I wasn’t quite ready to return home. I pulled back onto A1A and figured what the heck, I’m pointed north, maybe I’d just meander up the road apiece. 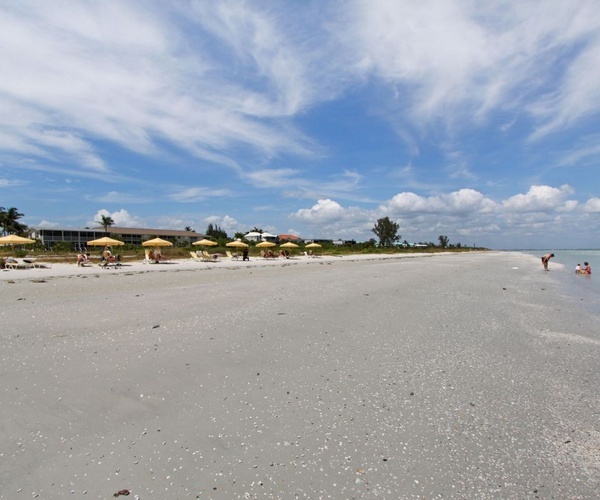 St. Augustine was looking good as a possible destination…. 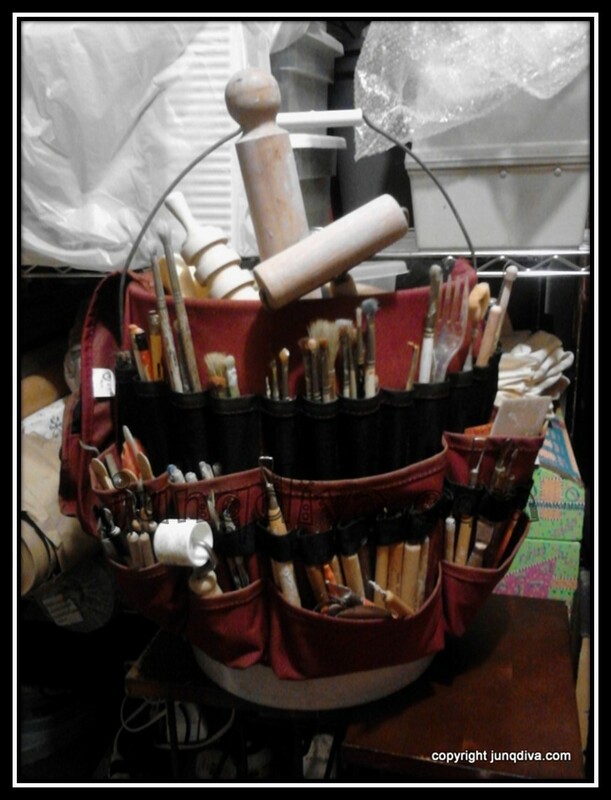 1-My pottery tool bucket-an assortment of store bought, re-purposed and handmade tools. Five miles or so north of Flagler Beach you enter ‘The Hammock’ area of Flagler County. I started to notice signs saying Art Show Tours at various businesses along the road. The traffic was unusually heavy and I soon saw the flashing lights up ahead of a county cruiser. It was too far away to know the cause and soon we were all moving at a snail’s pace. It turned out to be traffic control to allow for pedestrian crossings. As I crept by I saw small mobs of people on both sides of the road. On the left was ‘The Baliker Gallery’ and on the right was a decent sized cluster of craft show tents that were being sponsored by The Flagler County Art League. Cars were parked on both sides of the road so I decided to turn around and find myself a spot. Getting out of the car, I noticed that it was a little hazy but hot. Thankful that this part of the Hammock was heavily shaded with ancient old oaks, I figured I’d be okay for a little while (this is a big deal for me because I’m allergic to the sun…I know. 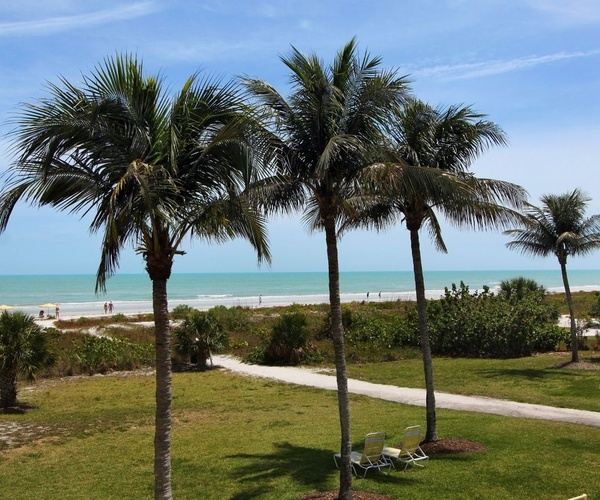 You’re probably thinking “What the heck are you doing living in Florida?”). Right off the bat my attention was grabbed by the booth manned by Faun Barnett and her husband Richard. They call their creations ‘Evolutions-recycled vintage silverware’ but what really grabbed my attention aside from the gorgeous wares; was the abundance of ingenious display props. I was kicking myself because my phone had just died and Faun had said she didn’t mind if I took some photos when I asked. We started to chat when all of a sudden one of the show promoters rushed up to the booth and announced that they had to shut down the show immediately. She pointed up to the northern sky and we all kinda gasped. I hadn’t been there more than six or seven minutes but in that short amount of time the wind had picked up fiercely and we saw an advancing wall of pure black in the sky. Forks of lightning flashed and the temperature dropped like a stone about 25 degrees. I saw in an instant the drawbacks to outdoor shows if you aren’t prepared. One poor Vendor, a young artist with huge acrylic paintings of vintage rock stars and other Sixty’s era subject matter, had no tent covering at all. I asked Faun if she needed any help but they said they had it covered. I wished her good luck with the storm. The promoters were rushing around urging patrons to leave and seek shelter, so I felt it best to get out of their way. I made it back to the car just as the first fat, icy drops began to fall. I was so disappointed because I figured I wouldn’t get an opportunity again anytime soon. Little did I know how wrong I was…? The next day after my daughter got home with my grandyboys from church, she asked if we could go out and do something. She wanted to go out and check out the thrift shop in Flagler that I’m always raving about. We got a bit of a late start and saw that we had just missed the closing deadline by about ten minutes. So I said let’s just go for a ride. I was telling her about my adventure the day before and suggested we see if by chance the show from the day before was a multi-day event. She was game and I said we could take the boys to Bing’s Landing to watch the boats on the intercoastal waterway. We saw as we approached that there wasn’t any traffic control, it was just approaching 4pm and I slowed down as we got closer. Several tents were still up so we parked, unloaded the double stroller, strapped in the boys and walked over. Most of the vendors were packed up and striking their tents but I saw that Faun and her husband Richard still appeared to be set up. They’ve been together twenty years. 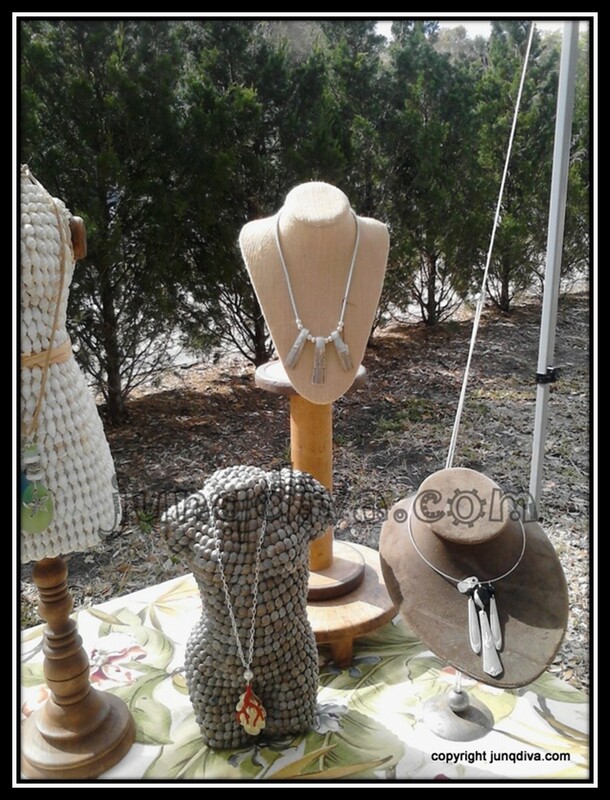 Evolutions started out as a hobby and they rented a space in an antique and craft co-op in Ashville, NC. Word got out about their fabulous creations and before too long they were supplying six different shops in the Ashville area. Richard recently retired and they began splitting their time between here and Ashville. 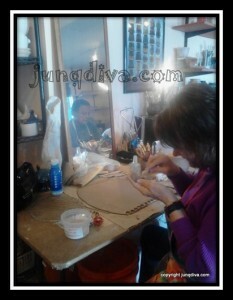 Faun is the genius behind the lovely jewelry and Richard builds the displays. Below you will see the results of their team collaboration. They are truly wonderful. If you would like to contact Faun and Richard click here. Enjoy the photos and thanks for reading my first ‘real’ blog post. 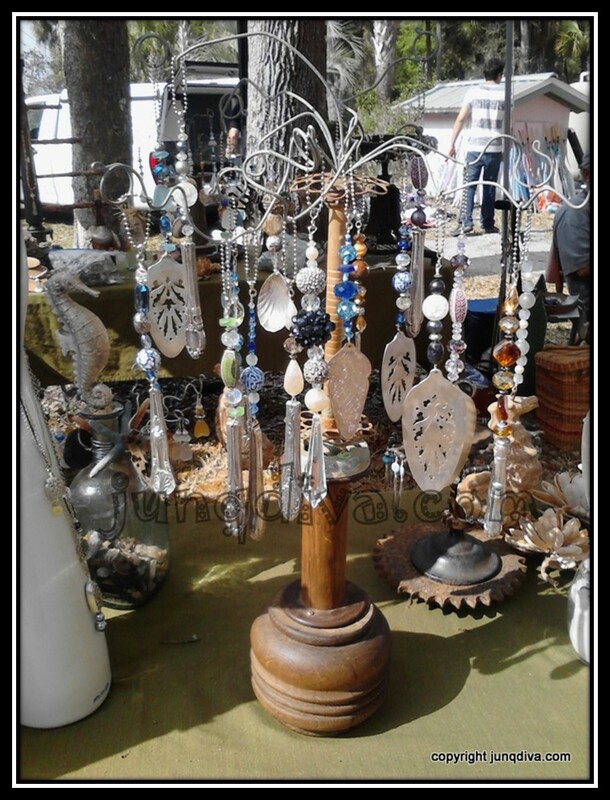 3-Craft Show display from Evolutions–Recycled vintage silverware–from the creative husband and wife team of Faun and Richard Barnett. 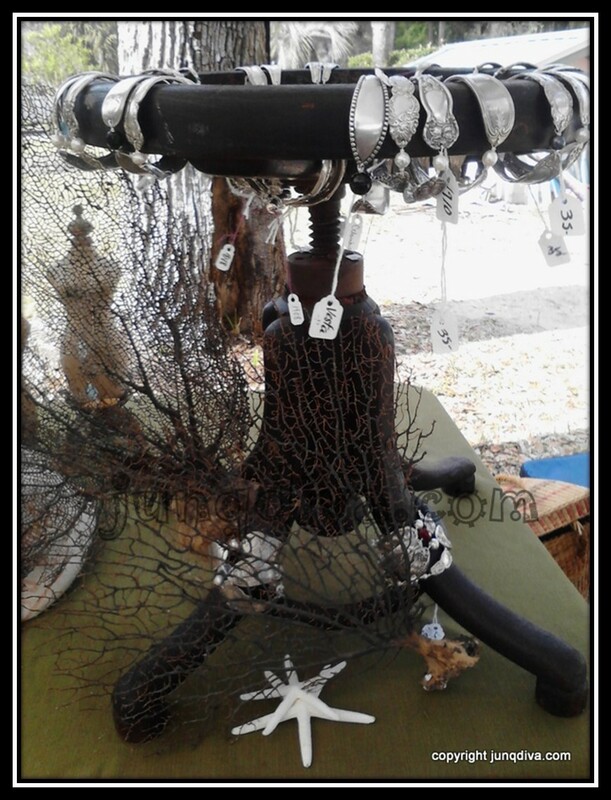 Detail of repurposed antique swivel stool display stand. 4-Craft Show display from Evolutions–Recycled vintage silverware–from the creative husband and wife team of Faun and Richard Barnett. 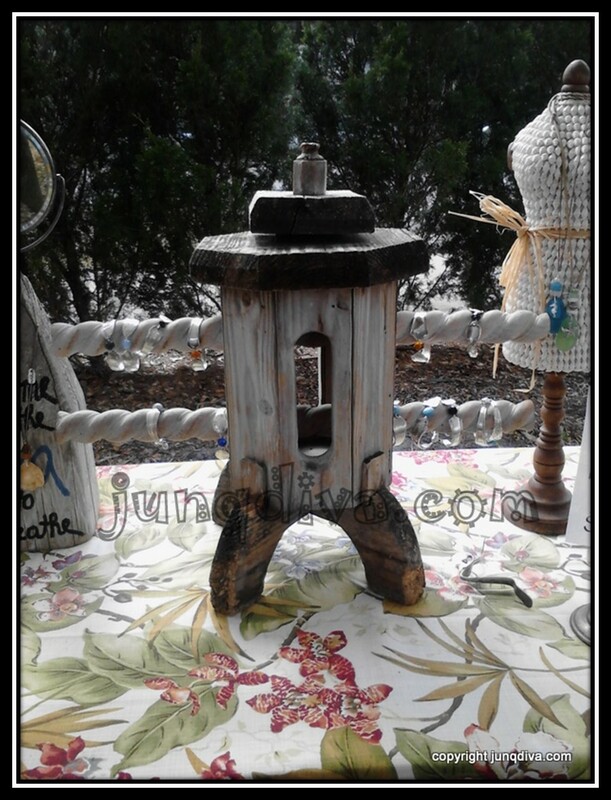 Detail of repurposed antique swivel stool display stand. 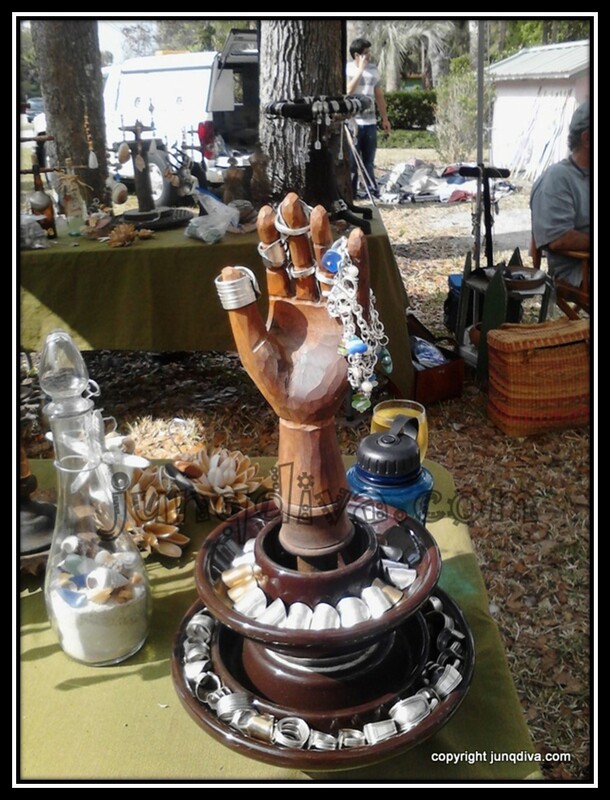 5-Craft Show display from Evolutions–Recycled vintage silverware–from the creative husband and wife team of Faun and Richard Barnett. 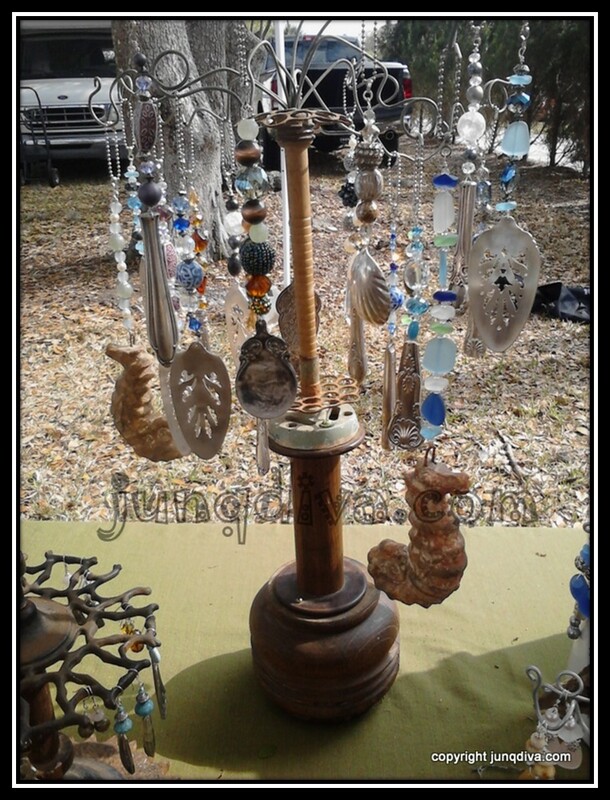 Re-purposed antique spool and vintage parts jewelry display unit. 6-Craft Show display from Evolutions–Recycled vintage silverware–from the creative husband and wife team of Faun and Richard Barnett. 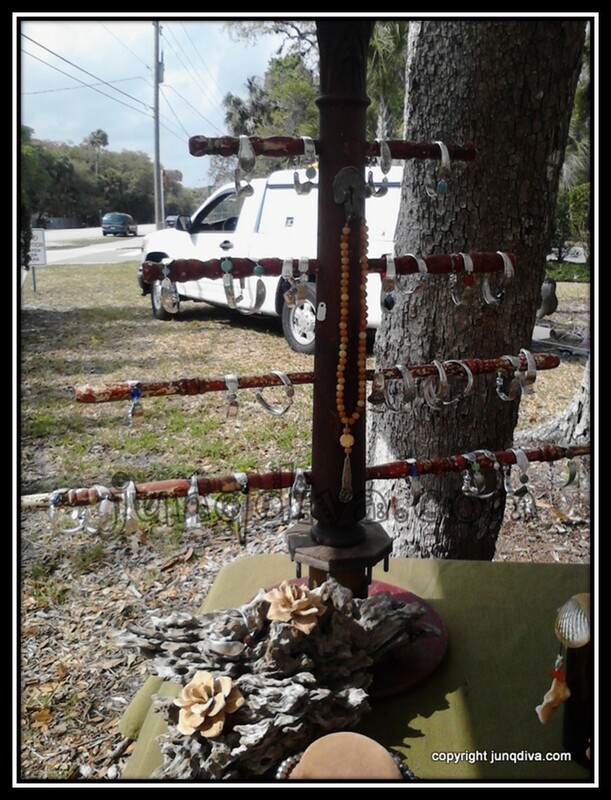 Re-purposed antique furniture parts into jewelry display. 7-Craft Show display from Evolutions–Recycled vintage silverware–from the creative husband and wife team of Faun and Richard Barnett. 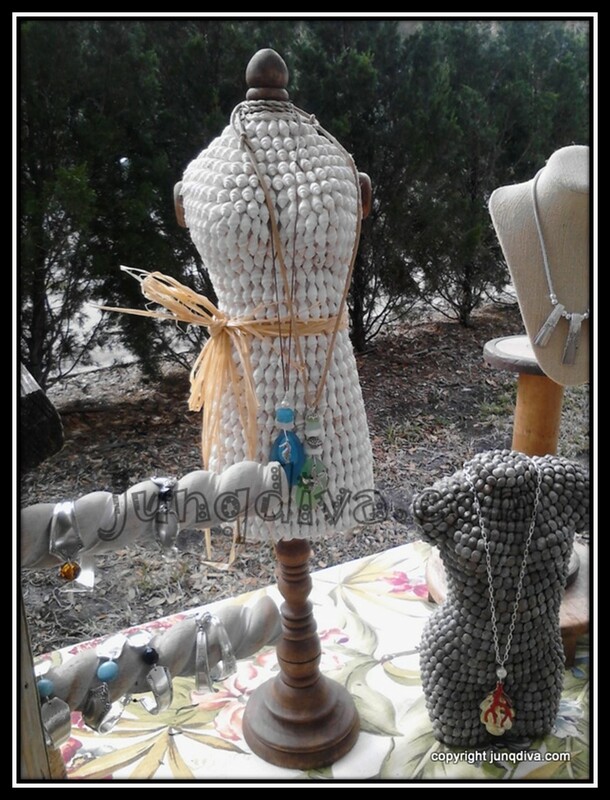 Shell embellished miniature dress forms partnered with re-purposed antique spools and other found objects-1. 8-Craft Show display from Evolutions–Recycled vintage silverware–from the creative husband and wife team of Faun and Richard Barnett. Shell embellished miniature dress forms partnered with re-purposed antique spools and other found objects-2. 9-Craft Show display from Evolutions–Recycled vintage silverware–from the creative husband and wife team of Faun and Richard Barnett. Shell embellished miniature dress forms partnered with re-purposed antique spools and other found objects-3. 10-Craft Show display from Evolutions–Recycled vintage silverware–from the creative husband and wife team of Faun and Richard Barnett. 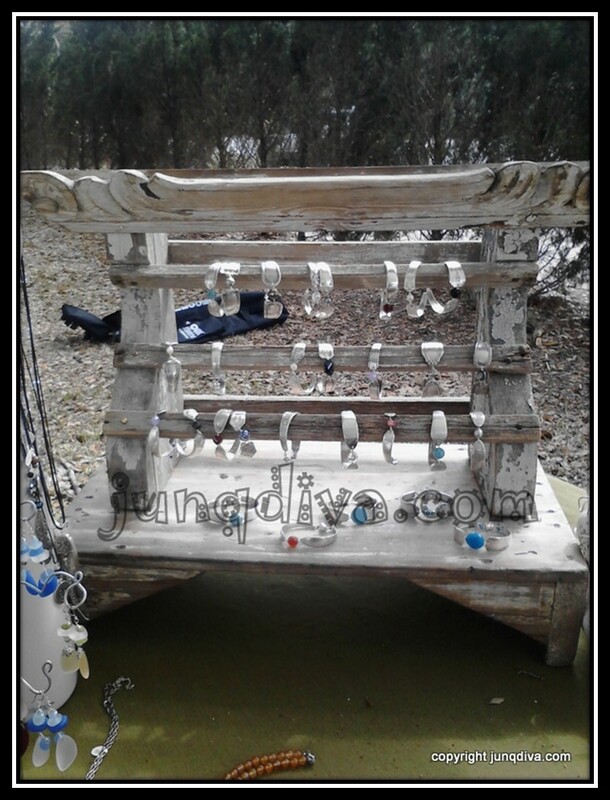 Jewelry display from recycled vintage architectural bits and pieces’. 11-Craft Show display from Evolutions–Recycled vintage silverware–from the creative husband and wife team of Faun and Richard Barnett. 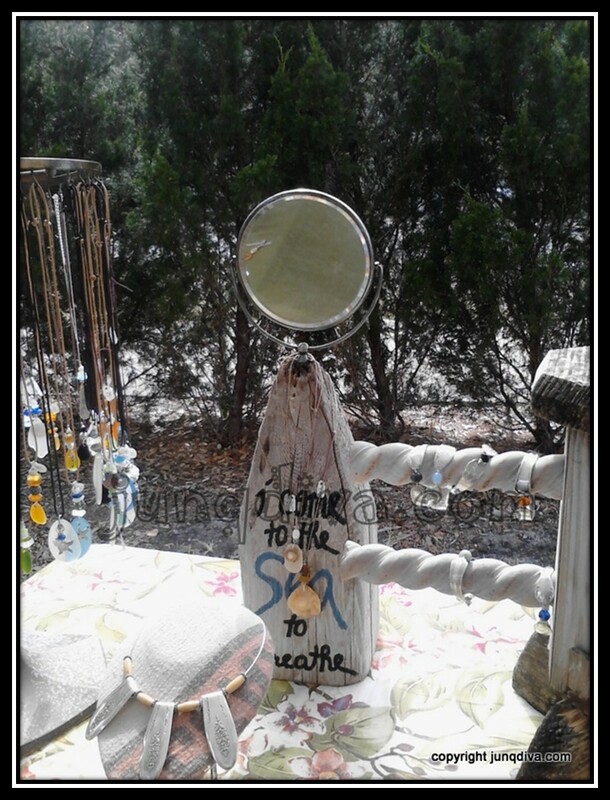 ‘How Does It Look’ vintage mirror and buoy re-do. 12-Craft Show display from Evolutions–Recycled vintage silverware–from the creative husband and wife team of Faun and Richard Barnett. 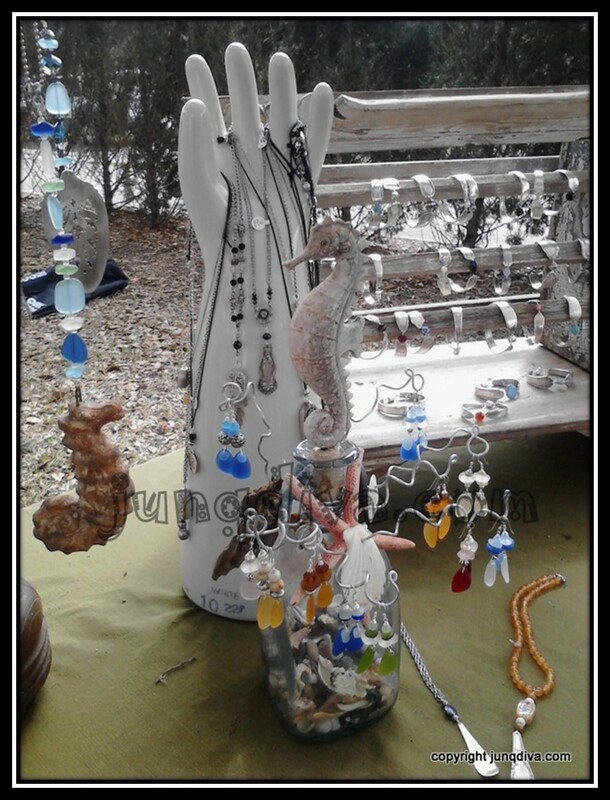 Great redo of vintage found objects jewelry display. 13-Craft Show display from Evolutions–Recycled vintage silverware–from the creative husband and wife team of Faun and Richard Barnett. 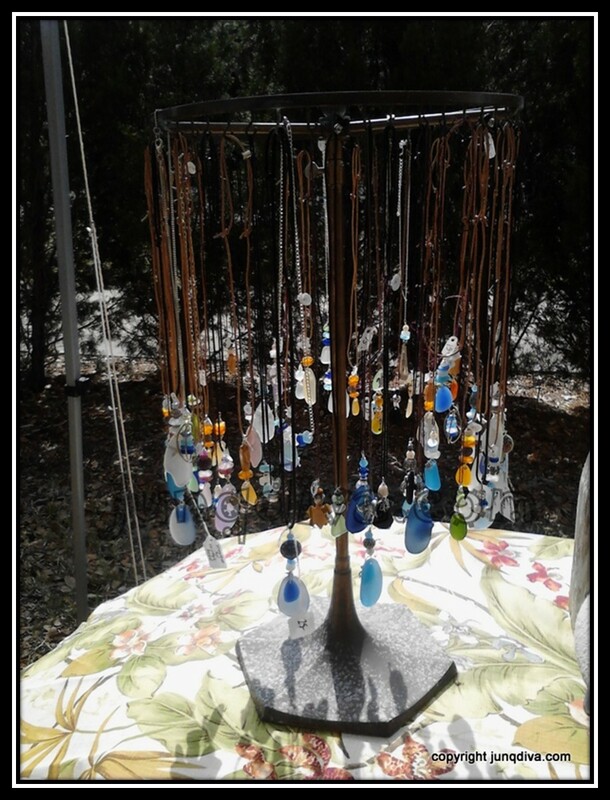 Another Great redo of vintage found objects jewelry display. 14-Craft Show display from Evolutions–Recycled vintage silverware–from the creative husband and wife team of Faun and Richard Barnett. 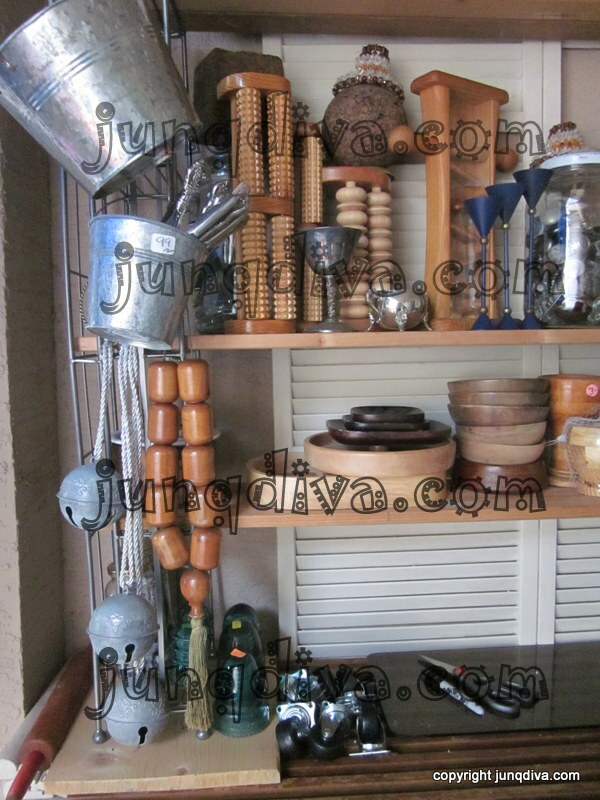 Fantastic use of found architectural objects for display! 15-Craft Show display from Evolutions–Recycled vintage silverware–from the creative husband and wife team of Faun and Richard Barnett. 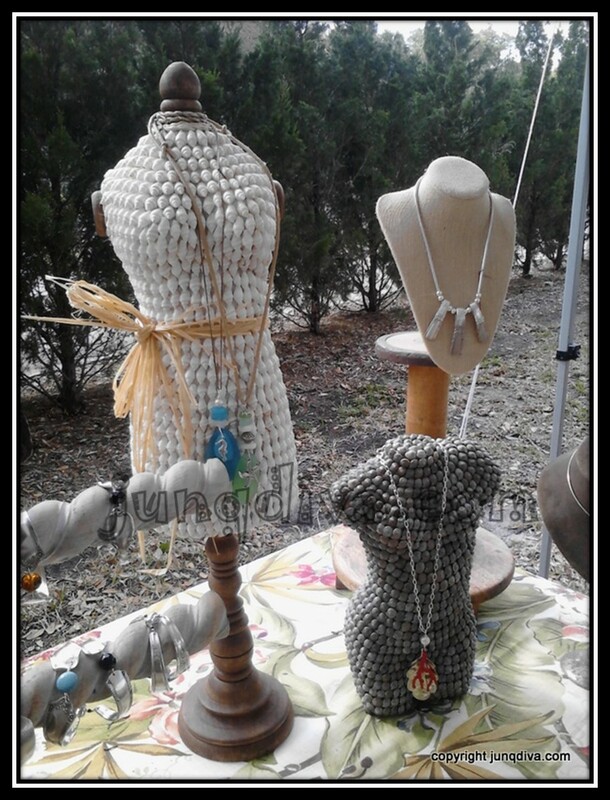 And Another Great redo of vintage found objects jewelry display. 16-Craft Show display from Evolutions–Recycled vintage silverware–from the creative husband and wife team of Faun and Richard Barnett. Love the way they create and display!!! 17-Craft Show display from Evolutions–Recycled vintage silverware–from the creative husband and wife team of Faun and Richard Barnett. 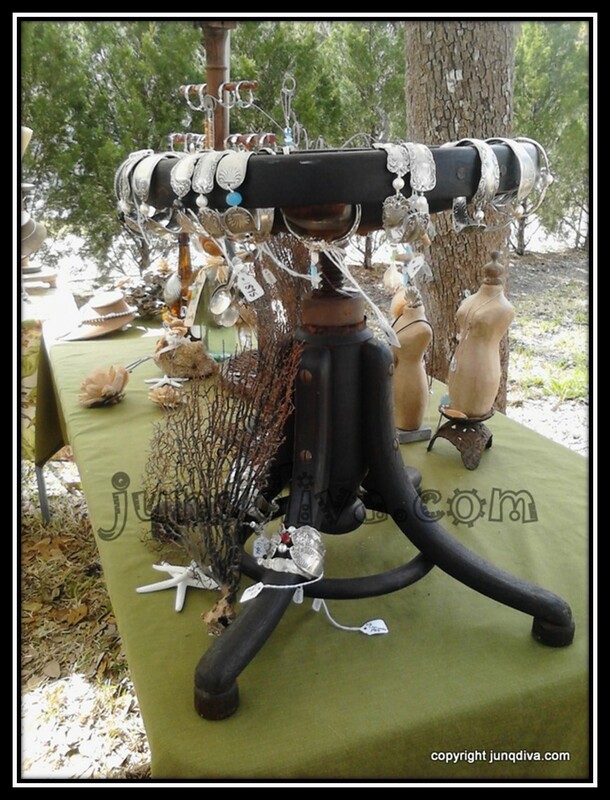 Great redo of vintage found objects jewelry display. I’ve been Re-Creating trash to treasure just about my whole life but this will be my first attempt at blogging about it. Bear with me as I familiarize myself with the process and I hope that you will find it will be worth the wait. Thanks for stopping by! IS YOUR CREATIVE INSPIRATION HIDING? 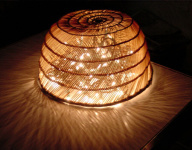 | pibbsdreamquest on IS YOUR CREATIVE INSPIRATION HIDING? inspirational on IS YOUR CREATIVE INSPIRATION HIDING? 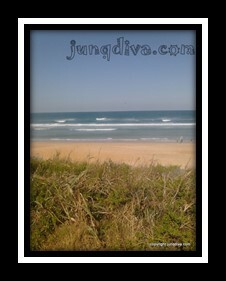 Copyright © junqdiva.com Blog .